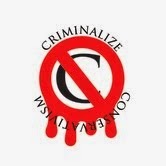 Criminalize Conservatism: Today's GOP Base? Yesterday's post was titled, "It's Tea Bagger Time For The Low Information Voter," and today is a continuation of sorts as we take a very quick look at the GOP's base to find out who they are and where they come from. 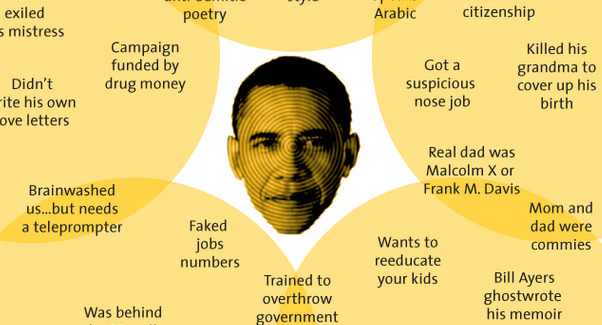 "Here are all the conspiracy theories about Obama in one simple chart." And speaking of the base and good conspiracies, please say hello to Mema! "Meet Fox’s Biggest Fan: Mema from Tosh.0 Just LOVES Nancy Grace and Bill O’Reilly! (Video)." "If you don’t know Mema (Mee-MAW), you don’t know the internet. Most of us know Mema as the adorably bat-brained grandmother of the angry “Gingers DO have souls!” kid from Daniel Tosh’s eponymous dot-oh show. She was in fact Tosh’s discovery, quickly eclipsing her grandson in internet stardom with her quirky combination of backwoods ignorance, innocent charm and hilariously brief moments of lucid self-awareness. Mema’s the kind of person who loves to talk, but whose best moments come when she actually hears the words coming out of her mouth. And apparently, she’s a big fan of Fox News. "It’s no secret that Fox’s viewers are old, white, rural and generally confused. While Rupert does love to tout the education level of his (still living) older viewers, but there is a pretty strong flip-side to Fox’s demographic. That is, Mema’s side. The side that’s certain of its opinions, but not sure what its certain about. But hey, credit where it’s due to Fox — that’s the kind of diversity you get from finding and pandering to the lowest common denominator. "Which, since Married: With Children, has been something of a Fox Network specialty. So, park your million-mile Dodge on the lawn, don your NO MA’AM t-shirt and have Peg fetch you a beer; it’s time to hear why Mema loves Fox programming..."
But you ask, where do these people come from? "I Helped Start the Religious Right: Here's How We Tried to Undermine Secular America -- and Build a Theocracy." 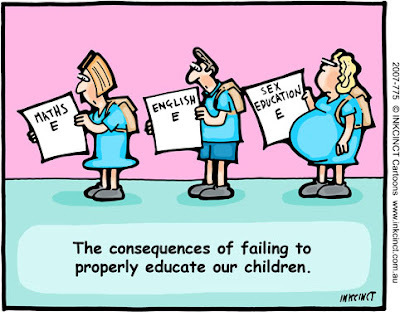 "Christian home-schooling is at the core of the project. "As someone who participated in the rise of the religious right in the 1970s and 1980s, I can tell you that you can’t understand the modern Republican Party and its hatred of government unless you understand the evangelical home-school movement. Nor can the Democrats hope to defeat the GOP in 2016 unless they grasp what I’ll be explaining here: religious war carried on by other means. "The Christian home-school movement drove the Evangelical school movement to the ever-harsher world-rejecting far right. The movement saw itself as separating from evil “secular” America. Therein lies the heart of the Tea Party, GOP and religious right’s paranoid view of the rest of us. And since my late father and evangelist Francis Schaeffer and I were instrumental in starting the religious right — I have since left the movement and recently wrote a book titled 'Why I Am an Atheist who Believes in God: How to Give Love, Create Beauty and Find Peace' – believe me when I tell you that the evangelical schools and home school movement were, by design, founded to undermine a secular and free vision of America and replace it by stealth with a form of theocracy. The Evangelical home school movement was really founded by two people: Rousas Rushdoony, the extremist theologian, and Mary Pride, the 'mother' of fundamentalist home-schoolers. I knew them both well..."
Who ARE these guys and what do they want? To paraphrase a familiar nighttime comic, we kid the GOP...not. The base of the GOP on the bottom are the intellectually challenged and hate-filled Baggers, but as George W. Bush "joked," the base is really the greediest and wealthiest among us who would steal all we have and brush aside all the people that have to die to achieve their aims. ...it's also a criminal cartel by any definintion. Isn't it time to criminalize "Conservatism" before it's too late? Joyce, Jnr. Christine O'Donnell, at a 1998 appearance on Bill Maher's Politically Incorrect."